Professional-level kitchen back-up will nurture your culinary talents. 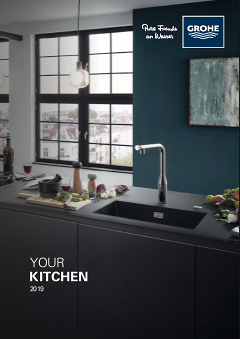 This Eurodisc Cosmopolitan range kitchen tap has a 360° swivel action to optimise your range of movement and impress even the hardest-to-please working chefs. You can fill large pots easily under its generous high spout, and the pull-down spray head is so handy for washing fruit and veg. The built-in GROHE SilkMove technology powers the single-lever mixer's effortless glide. Presented in GROHE StarLight chrome, this tap is a marriage of user-friendly tech and alluring looks.